Come out for Bakers Dozen annual Summer Tour to Coastways Ranch. We will tour the organic berry farm, and be allowed to pick a complimentary basket of berries to take home. 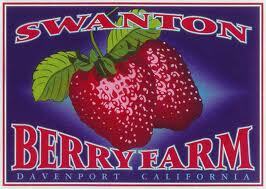 After the tour, we will drive south to the Swanton Berry Stand to pick and buy more berries. Note: We will meet at Coastways Ranch, just down from Ano Nuevo Reserve on Hwy 1, NOT the Swanton Berry Farm which is 8.5 miles south of the Ranch.